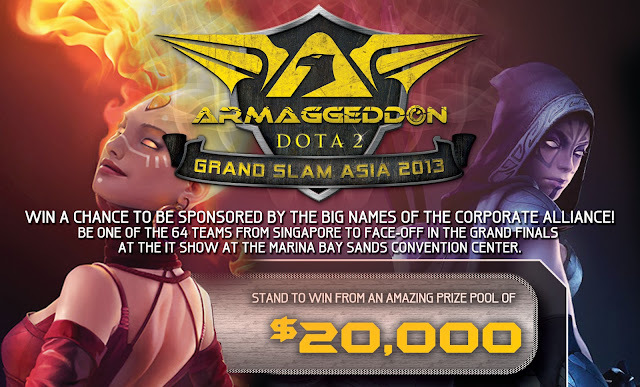 If the rather recent DOTA 2 The Asia wasn't itself a feast for our eyes on our regional DOTA 2 eSports scene, you will be glad to hear that even more action will be taking place as up and coming gaming gear manufacturers Armaggeddon will be organising a huge tournament regionally, or in their own words, a 'DOTA 2 Grand Slam'. At first glance, what will catch your eye would probably be its prize pool of up to $20,000 for its Grand Slam finals in Singapore (and the RM10,000 allocated for the Malaysian Grand Finals). Though well this is not the biggest amount an eSports tournament has offered before, it is ultimately still a large sum of money and would forseeably attract some of our top talents, regionally and locally. But what is more interesting, and definitely worth a shot, is Armaggeddon's offer for an exclusive sponsorship contract with them and their 'corporate alliance' with some of the top brands in the industry like AMD, Asus and Valve. Quite obviously, Armaggeddon is scouting for an up and coming DOTA 2 team to fully-sponsor, support, and nurture while bringing their company's brand up as well. With that, they have opened the Grand Slam tournament around Asia for the usual SEA countries and even extending to Sri Lanka, though noticeably missing out huge countries like India and China. The Grand Slam finals which will determine who the company will ultimately sponsor is set on the 9th of March at Singapore, Marina Bay Sands. But meanwhile, Armaggeddon has opened up registrations for its very first sets of qualifier in Malaysia and Singapore which will begin as early as (at the point of writing this) exactly next week - 25th January.